Northwestern University in Qatar has released preliminary findings from a Pan-Arab survey showing that although web users in the Middle East support the freedom to express opinions online, they also believe the Internet should be more tightly regulated. Researchers surveyed 9,693 adults in eight Arab countries - Egypt, Qatar, Tunisia, Bahrain, Lebanon, Saudi Arabia, Jordan, and the UAE - shedding light on how people in the region use media, and whether they trust their sources of information. Everette E. Dennis, Dean and CEO of NU-Q, said, "This study considers how people's use of media is closely connected to what they think about media – particularly the news media following the so-called Arab Spring that began in 2011 – and how important various outlets are to them in their daily lives. We hope this study benefits news consumers and decision-makers, and contributes to the general understanding in the media of this fast-changing region." The research showed a large majority of adults in Saudi Arabia, Jordan and the United Arab Emirates believe their news media are credible (74 percent, 67 percent and 63 percent, respectively). Meanwhile, only approximately one in four of those surveyed in Egypt, Lebanon and Tunisia believe the news media in their countries are credible. "This is a particularly interesting phenomenon in Lebanon, as this is thought to be a country with 'free press,'" commented Dennis. Respondents were far more likely to agree than disagree that the quality of news reporting in the Arab world has improved in the past two years. Among all respondents, 61 percent agreed, 14 percent disagreed. 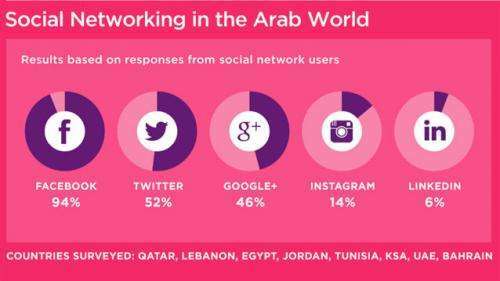 Participants who use social media, almost all use Facebook (94 percent); Twitter attracts 52 percent; Google Plus 46 percent and Instagram 14 percent, the majority of whom are in Bahrain. Television is considered to be the most reliable source of information except in Bahrain, the country with the highest overall media use, where the internet is thought to be the most reliable source of information. According to Dennis, the methodology used to collect results makes this a "watershed survey for researchers looking at media and internet use in the Arab world. We used face-to-face interviews rather than the conventional web surveys, as well as phone interviews where the respondents were selected by random selection from a directory of listed telephone numbers as well as a sample of mobile numbers," he explained. "This ensures that we have comprehensive and genuine data that can be trusted by observers and policy makers in Qatar and in a region that is reshaping the role of the media." The study was conducted in collaboration with Harris Interactive, one of the world's leading polling organizations. Humphrey Taylor, Chairman of The Harris Poll, said "this survey breaks new ground in both quality and content, as it explores issues not often studied in the region. And, it is one of the only studies of its kind made available to the public." An interactive Web site, menamediasurvey.northwestern.edu, was produced by NU-Q to make the data available and accessible to both professionals and general news consumers alike, features dynamic data displays that allow users to make their own comparisons between different countries, as well as between different demographics surveyed within each country, including gender, age, and the juxtaposition of nationals, Arab expats, Asian expats and other expatriates. The findings were presented during the second session of the Qatar Media Industries Forum, an initiative of NU-Q that brings together senior officials of media enterprises in Qatar. The Forum provides participants with a neutral platform to explore key issues of Qatari and regional media industries. One absolutely proven way they use social media in the Mideast is to provide step-by-step instructions on how to use pressure cookers to kill infidels and children. Social media is shaping up to be a powerful medium. It ignited the Arab Spring after all. It's a shame the Arab Spring is faltering, but the movement is still young. The moderates may yet win that war. Let's hope so. Geokstr, I've been a member here for about 15 minutes and have seen two islamophobic comments from you. Is this common here?